4 What Can Be Done? 5 What type of content to include on the Facebook page? This wiki resource is designed primarily for physiotherapists who are actively seeking to increase participation in physical activity through the use of social media. 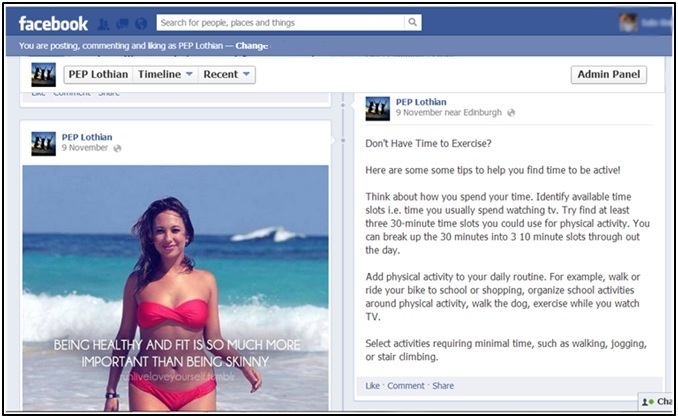 While this resource has focused on promoting physical activity in teenage females and has centred on the social networking site ‘Facebook’, it is hoped that the principles highlighted will be of benefit to any health professional or wider body, seeking to promote health and wellbeing, regardless of the targeted demographic or facet of social media adopted. The wide-ranging physical, social, and psychological benefits that can be gained from physical activity are well documented. Despite this, participation levels in teenage females remains low. This resource specifically aims to address this issue. Conventional methods of promoting the benefits of physical activity appear to be failing this group, therefore it is believed that the emerging growth in social media can be a useful and productive method of engagement with this demographic. This resource is not designed to be a ‘how-to guide’ or ‘blueprint’ to expanding social media, it is however designed to make the user aware of some of the numerous issues that revolve around developing social media as an organic and interactive medium to promote health, physical activity, and wellbeing. It is hoped that this resource will act as a useful tool to the user in developing their own individual social media resource, as a template for potential in-service education and as a constructive part of the user's continuing professional development (CPD). Justify and critique the need for health promotion and increased physical activity for teenage females. Critically evaluate the current guidelines regarding physical activity in young people. Analyse participation and physical activity levels in teenage females. Critically evaluate social media as a medium by which to engage teenage females. Develop a social media resource aimed at promoting physical activity for teenage females. Synthesise appropriate information required to create a social media resource for this population. Evaluate the effectiveness of this resource relative to its aims. In 2011, Start Active, Stay Active was published in conjunction with the Department of Health, Social Services and Public Safety, The Scottish Government, Welsh Government, and the Department of Health. This UK-wide document presents guidelines on the amount, duration, frequency and manner of physical activity required across various age related demographics to achieve general health benefits. 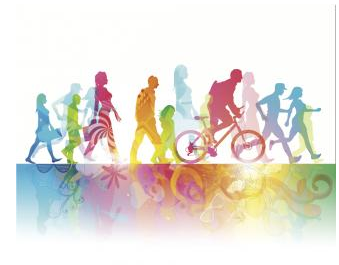 This report from all four Chief Medical Officers across the UK is aimed at a range of organisations (inclusive of, but not limited to, the NHS and local authorities) whose intention is to design services to promote physical activity. The document was formulated for policymakers, professionals, and practitioners whose aim is to devise and bring into effect policies and measures that employ the promotion of physical activity, sport, and exercise in order to achieve health benefits. 1. All children and young people should engage in moderate to vigorous intensity physical activity for at least 60 minutes and up to several hours every day. 2. Vigorous intensity activities, including those that strengthen muscle and bone, should be incorporated at least three days a week. 3. All children and young people should minimise the amount of time spent being sedentary for extended periods. Significant evidence, composed of both observational and experimental research, suggests that regular involvement in physical activity among children and young people offers benefits for physical and psychological well-being both in the short and long term. With specific reference to the guidelines highlighted by Start Active, Stay Active, greater levels of physical activity have been shown to be associated with more positive health-related outcomes. This is reported in studies which showed improvements in health-related measures as a result of exercise-based interventions. Equally, although some health benefits have been reported as a result of only 30 minutes of moderate-intensity physical activity every day, it has been suggested that this should be implemented as a ‘stepping-stone’ towards the optimal level of 60 minutes. Physical activity of vigorous intensity has been shown to improve components of health such as cardiorespiratory fitness, bone strength and muscular strength. More recent evidence suggests that the optimum amount of physical activity required to improve bone health may be greater than previously understood. This is reflected in the guidelines as an increase from twice to three times per week. The current evidence suggests that extended sedentary behaviour is an independent risk factor for reduced health and correlates strongly with obesity/overweight and metabolic dysfunction although the evidence does not offer any specific maximum or minimum recommended periods of sedentary behaviour. “Use social media opportunities to promote the Pledge and physical activity." In Scotland, by the time females have reached the age of 18, 40% dropout of all sports activity. It is well documented that sport dropout rates for teenage females exceed that of males the same age. The Scottish Government’s 2020 healthcare vision recognises Scotland’s population is living longer. This demographic change will place an increased strain on healthcare budgets. The vision also recognises the need to focus on prevention. Targeting teenage females to increase their physical activity is one of the necessary health prevention measures to help ensure the health of the future work force and to reduce the demand on health services. Please click the following link for further information regarding 2020 Healthcare vision. Decreased physical activity has a number of consequences. Individuals failing to achieve activity levels previously mentioned in the 'Start Active, Stay Active' guidelines, are more prone to coronary heart disease, osteoporosis, type two diabetes, hypertension, obesity, non-specific lower back pain, as well as an increased prevalence of cancer. Exercise also promotes psychological and social wellbeing. The psychological benefits include increased self-esteem, confidence and body image perception, along with decreased stress, depression and anxiety by up to 48%. Developing team-working skills, increased sexual health and academic performance are included in some of the social advantages. Studies have also demonstrated that exercise can reduce the likelihood of teens engaging in anti-social behaviour which is described as causing harassment, alarm or distress to members of society through intention or negligence. Health promotion is a vital component of the role of a physiotherapist. The current system of health promotion of physical wellbeing aimed at teenage females, with a dropout rate of 40%, does not appear to be working.There is a need for new, innovative strategies focusing on health prevention in teenage females, considering the high level of sports dropout within this population. The Woman’s Sport and Fitness Foundation (WSFF) is encouraging national governing bodies to use social media methods such as Facebook to encourage sports participation in teenage females. The WSFF also highlight some of the reasons related to dropout rates, these include 'friends no longer participating', 'too competitive' and 'issues of body consciousness'. These reasons contribute to a negative spiral associated with increased dropout rates and highlights how a vicious cycle can occur when even a few participants dropout of an activity. To target the population of teenage females in order to promote physical activity and healthy living, one must recognise the best means of communication with which to do so. Social media refers to forms of electronic communication through which users create online communities to share information, ideas, personal messages, and other content. These include social networking sites, such as Facebook, YouTube, Twitter, and Pinterest as well as podcasts, blogs, wikis, forums, and content communities. Social networking is the fastest-growing active social media behaviour online, increasing from 36% to 59% of global internet users managing their profile on a monthly basis by the end of 2011. The YouTube video below provides a brief depiction of the vast worldwide communication through social media that has become a so prominent in recent history. Utilising these methods of communication to promote an idea, event, lifestyle, or product is presently being undertaken by millions of people around the world. 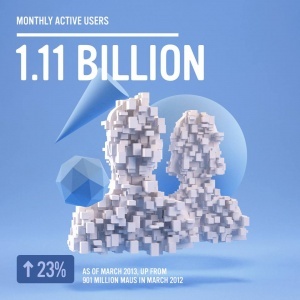 As of 2012, there are over 2.8 billion social media profiles, representing around half of all Internet users worldwide. Currently, and more importantly, AHP Directors along with the Scottish Government have proposed, through the aforementioned Pledge, a ‘call to action’ to AHPs to promote physical activity in all Health Boards across Scotland. Therefore, physiotherapists have a professional responsibility regarding the promotion of physical activity and with this resource it is hoped, a greater ability to effectively engage the taget demographic of young females through social networking. To view the Pledge please click here . Current evidence and statistics suggest a multitude of different social networking resources could be of benefit in targeting teenage females. For the purpose of this resource, Facebook will be the social network of choice to connect and communicate with the chosen demographic. There are many positive attributes and reinforcing evidence to suggest that Facebook will be efficient and effective at reaching this target audience. 89% of agencies reported an intent to use Facebook to advertise for their clients in 2012 – either by purchasing ads, creating pages, or other methods of engagement. In the UK, at the beginning of 2013 there was an estimated 33 million accounts for Facebook, which is just under 53% of the UK population. In 2012, it was reported that both Facebook and Twitter have the same gender distribution, being 40% male and 60% female, whereas Pinterest is the most female-dominated site with 79% of its users being female. Research carried out by the London School of Economics for the European Commission in 2010, surveyed 25,000 youths, between the ages of 9 and 16 from across Europe. In the UK, 88% of the 13 – 16 year olds maintained a social networking profile, more specifically, 46% of these 13 – 16 year olds used Facebook as their main social network site. 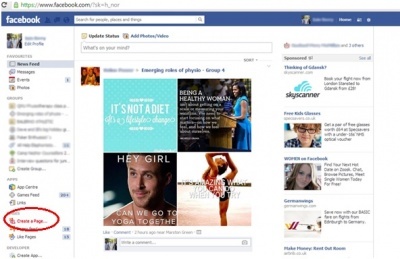 Although this resource is focused on the development of a Facebook page as a social media tool to promote physical activity in teenage females; it is important to understand the changing trends that occur within social media in order to keep up to date with the best resources available to connect and communicate with the target audience. Changing trends have been reported recently regarding teenage use of social networking. Although Facebook appears to be in relative decline, it continues to have a significant online presence and at this time remains suitable in both targeting the chosen demographic, and as a medium for presenting the chosen information aimed at increasing physical activity levels within this demographic. However, this may not be the case in the future and health professionals should be aware of this. Figure 1 shows the trends that have been reported in October 2013. The incidence of adolescents searching for health related information has also been studied. Borzekowski and Rickert (2001) reported that physical activity, fitness, and exercise ranked second among health topics searched for online by youths in a school-based survey (Table 2). 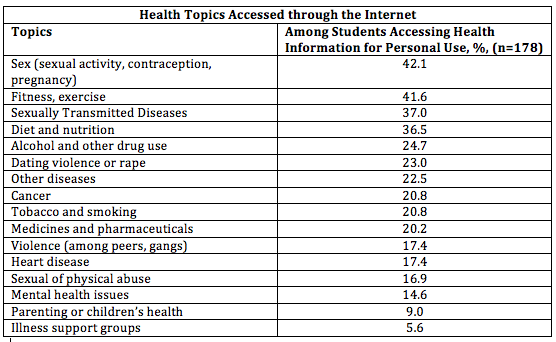 This particular survey does not consider gender differences, yet another questionnaire involving the same students revealed that girls rated information on birth control, diet and nutrition, exercise, physical abuse, sexual abuse, and dating violence as the most worthwhile to have access to on the internet. Similarly and more recently, Ettel et al. (2012) revealed that a significant number of students trusted the online information, and nearly one-quarter subsequently modified their behaviour, regardless of whether or not the information students retrieved was from a legitimate source. 'Researching' on the Internet by students often includes sites such as Wikipedia, an online encyclopedia that anyone can edit. It is unreasonable to expect adolescents to delve into peer-reviewed medical literature. A physiotherapist’s Facebook page will be considered a legitimate source, as we maintain clinical governance and evidence-based practice as outlined by CSP. A systematic review was performed by Lau et al. (2011), which presented evidence supporting positive effects of information and communication technology in physical activity interventions for children and adolescents, especially when used with other delivery approaches (eg. face to face). The review recognised the explicit need for increased studies and research into the impact of social networking to promote physical activity in children and adolescents, and also recognised that the development of a physically active lifestyle may require up to 6 months, therefore considerations for longer duration follow ups may be needed. Social media, in today’s teenage population, has become a significant part of every day life, and social networking has been shown to be the most commonly adopted. Social networking and more specifically Facebook is an appropiate medium for physiotherapists and other health professionals to connect and effectively communicate with the demographic of teenage females in order to promote health and physical activity. What type of content to include on the Facebook page? It is vital that the information on the Facebook page is appropriate and safe for the target audience. It needs to be an effective intervention to achieve its aim to promote physically active lifestyles. 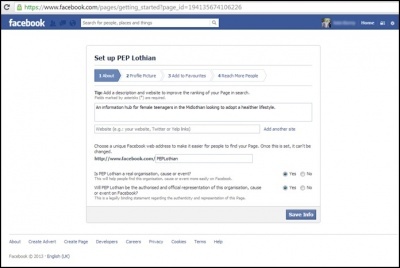 It also needs to be tailored to its target audience, in this case adolescent females aged between 12 and 18 years.The aim of this section is to provide ideas for the type of content that could be included on on a Facebook page, to aid a successful intervention. The recommendations are often based on fitness data, ignoring psychological readiness to exercise. Most exercise prescriptions are overly restrictive and do not allow for development of self motivation for regular exercise. Exercise recommendations based on rigid principles of intensity, duration and frequency are too challenging for many people especially beginners. The TTM integrates current behavioural status with a person’s intention to maintain or change their pattern of behaviour. The core of this model is five stages of motivational readiness for change, these are summarised in Figure 2. When considering content for the Facebook page, try to include information that is appropriate for people in each of these stages. For those in the precontemplation stage for example, provide information regarding the benefits of regular exercise, or tips for injury prevention for those in the maintenance stage. Social Cognitive Theory proposes that personal, behavioural, and environmental factors operate as collective interacting determinants. Interventions based on the Social Cognitive Theory focus on the importance of the individual’s ability to control her/his own behaviour and on how changes in the individual, the environment, or in both can produce changes in behaviour. Interventions derived from Social Cognitive Theory utilise techniques such as goal setting, self monitoring (exercise diaries) relapse prevention training, stimulus control strategies (identifying high risk thoughts and feelings) and social support to promote changes in physical activity. Informational approaches – aims to change the knowledge and attitude about the benefits of and opportunities for physical activity. Behavioural approaches – teaches people the behavioural management skills to adopt and maintain physical activity. Social approaches- aims to create a social environment that facilitates and enhances behavioural change. Environmental and policy approach- targets the structure of physical and organisational environment to provide safe, attractive and convenient places for physical activity. The advantage of a Facebook page is that all of these approaches can be utilised in one intervention, which can influence a large number of determinates at the same time. As mentioned earlier it is essential to tailor the intervention to its target audience. To optimise adolescent female's participation and adherence to physical activity, it is pointless providing information on the Facebook page that focuses on traditional, strict, 'boring' and unattractive exercise prescription. It is necessary to identify factors that are associated with physical activity, are amenable to change and can be addressed realistically within the page. Time constraint: Teenage females report being “too busy” and having conflicts with other activities which are preventing them from exercising.These findings suggest the importance of helping adolescents learn time management strategies. Include tips on the Facebook page advocating making physical activity a priority and recommend ways to fit physical activity into their daily lives eg. engaging in 3 x 10 minutes of physical activity spread throughout their day or by keeping activity logs. Support from parents, teachers and peers: Parents and teachers need to hear how much their support matters to their children, even at the high school level. In addition to parental support, peer influences appear to be very important with respect to participation in organised sport. Influences of a best friend were more highly associated with physical activity behaviour than influences of parents. 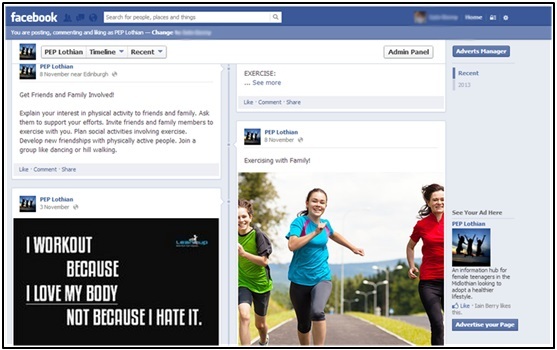 The Facebook page should encourage the social aspect of physical activity and emphasise peer support and participation as well as exercising with groups. Self-efficacy to be physically active: Another strong predictor of physical activity is self-perception and self-efficacy to be physically active. Bandura’s self-efficacy theory suggested that confidence in a personal ability to carry out a behaviour, influences adoption of that behaviour. Consequently, females who have high self-efficacy in their capabilities to be physically active will recognise fewer barriers to exercise or be less affected by them, be more likely to perceive the benefits of physical activity, and be more likely to enjoy it. Bandura’s theory indicated a number of sources of self-efficacy including: personal accomplishments, vicarious experiences (modelling), verbal persuasion, imaginal experience, physiological states, and emotional states. Having a combination of essential feminine and masculine qualities. Interestingly, adolescent girls often nominated a family member with affinity for sport as their role model. Exercise has been shown to improve body image among both men and women. For the purpose of a Facebook page, there are several things to keep in mind when promoting exercise and physical activity to improve body image. Firstly, when promoting exercise it is important to show a wide variety of body sizes, shapes and fitness levels. Showing super fit models sends the message that a fit appearance is a requirement for exercising, particularly in gyms. Secondly, the aim of the page should be to promote improving physical function, strength, endurance, and behavioural changes, rather than on changing physical appearance and losing weight per se. Efforts should be made to help females set realistic and attainable goals. Finally, although many females will start exercising to improve their body image, the page should be directed towards educating them about the other physical and mental benefits of exercise; as well as promoting the page as a resource to provide fun extra-curricular opportunities, spending time with friends or meeting new people, and to gain recognition from peers and adults rather than to prevent obesity or chronic disease later in life. • Promote healthy lifestyle changes. • Provide cues for exercise motivation (pictures, memes and videos). • Make exercise enjoyable and purposeful. • Tailor information to the target audience. • Include information for all stages of motivational readiness for change. • Promote exercise with friends. • Advise on time management skills. • Offer a choice of activities. • Find convenient, safe and suitable places to exercise. • Encourage self setting of SMART goals. • Promote support from family and peers. • Suggest keeping daily exercise logs. • Use realistic role models. • Show a wide variety of body sizes, shapes and fitness levels. • Focus on weight loss and body image. • Use pictures of ultra-fit women with idealistic body types. • Promote unrealistic workout programmes. • Use difficult scientific language. In order to ensure the Facebook page is a successful intervention to promote physical activity in adolescent females, it is necessary to use evidence-based models and theories as a framework to understand the process of exercise adoption and adherence. Additionally, the information provided on the page should focus on key determinants of physical activity that are targeted towards adolescent females. Efforts should be made to suggest gaining support from significant others, address real and perceived time constraints, and help adolescent females feel better about themselves in general and more specifically about their physical activity skills. The CSP provides a document called Social Media Guidance, and should be referred to, to highlight the legal, regulatory and professional perspectives of using and creating a social media page as a professional. Specific guidance includes legal, regulatory and professional considerations. Maintaining privacy and confidentiality when uploading and sharing information. Be aware of defamation; consider what you are writing and communicating. Be alert to harassment, including racist, sexist or homophobic comments. Act in the best interests of service users. Respect confidentiality of service users. Keep high standards of personal conduct. Behave honestly and with integrity, making sure that your behaviour does not damage the public’s confidence in you and your profession. Ensure confidential information acquired remains secure. Recognise potential impacts of personal behavior, life-style and activity. Recognise the role as an advocate of physiotherapy. Maintain high security settings on personal accounts. Establish clear boundaries with users. - Do not respond to requests from users via your personal account. - Do not friend request/accept current or former users. - Ensure professional communications at all times. Gaining appropriate consent when using images, video clips and information. Giving clear information on how users' information will be used. As some users may be under the age of 18, it is important to have knowledge and an understanding of relevant policies relating to the care of children. When suggesting activities and groups on a social media page, items of safety, child protection and consent must be considered, eg. appropriate training, and criminal record checks. Being aware of child safety policies will fulfill the requirements of the CSP, HCPC and UK law to support the delivery of consistent high quality standards of care for children and their families. Consider inclusive programmes and activities that consider religion, culture, ethnic background, sexual orientation, gender-identity, physical and mental ability. Facebook users have to register and create a personal profile, after which they can connect or “become friends” with other users, exchange messages and become members of groups or followers of pages. Based on a survey of 4,000 physicians, 61 % of them use Facebook for personal purposes; and 15 % of them use it for professional purposes. Moreover, 33 % of physicians have received friend requests from their patients on Facebook and only 75 % of them declined the request. Therefore, it may be useful to create a separate professional profile before creating any page or group. The purpose of a Facebook Group is to provide a place for small group communication and for people to share their common interests and express their opinion. Conversely, Facebook Pages are useful for businesses, organisations and brands to share their stories and connect with people. Pages can be customised by adding apps, posting stories, hosting events and more. People who 'like' your Page and their 'friends' will get updates in 'News Feed'. 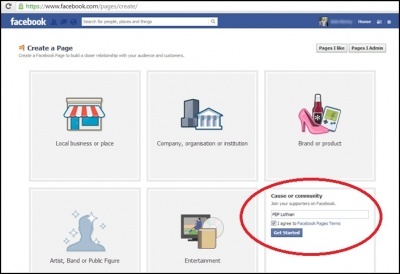 You can create and manage a Facebook Page from your professional account. Below is a guide on how to achieve this. 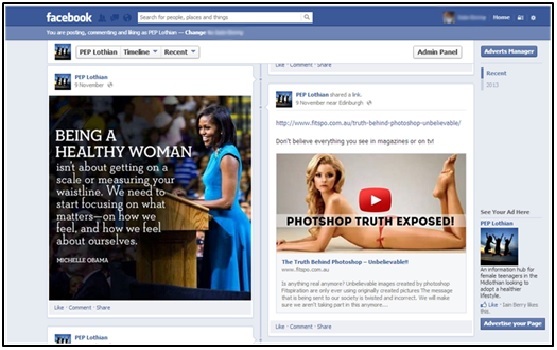 When creating a Facebook Page you need to first decide on a topic or idea to centre the page around. For the purposes of this resource we have decided to focus on health provision in teenage females in the Midlothian region of Scotland. Please click on the images to enlarge the print screens of the Facebook page. 1. Log in to your professional Facebook account and click on the ‘create a Page’ option in the sidebar. If this option is not available, enter ‘create a Page’ into the search box and it will take you directly to the screen. 2. Take a look at the main categories of the Pages and decide which one fits your resource. Click on one of the boxes to select that main category for your resource, and browse through the categories in the drop-down menus to see which one fits best; we found the community option best suited our needs. 3. 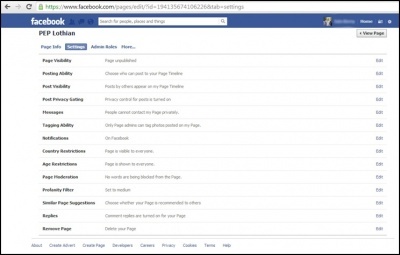 Enter the name of your resource and select the box next to “I agree to Facebook Pages Terms” after reading said Terms. You will be able to change your Page name up until the point you have 200 'fans' (or 'likes'). 4. Add your basic ‘about’ information. This information will appear on your page just below your cover photo. It should be noted that the ‘about’ page will be indexed in Google, therefore it useful to ensure it is very descriptive and contains relevant keywords. There is also the option to link to a website if you have one at this stage. You may want to direct people to other relevant sites, such as Twitter or other social media sites. 5. Add your profile picture. This image will appear next to every post that goes into the news feed from your Page so should be recognisable and associated to your resource (such as a logo). 6. Next you have the option to advertise your page in order to reach a wider audience (if there are finances available to do so). This option can be disregarded if it is not relevant to you. 7. Following this you will now have a completed Facebook Page and you will be directed to the page's admin panel. From here you receive updates about your page in a summarised form and, perhaps more importantly, at this stage, can access the settings section to edit your privacy and security options. 8. Finally, by clicking on ‘edit page’ and then ‘edit settings’ you will have the options to protect your page as you see fit. It may be useful to initially ‘unpublish’ your page in order to familiarise yourself with the page and make any alterations whilst it is not able to be viewed by the public. When the page is ready it can then ‘published’ again. By carefully considering each option in this section you can ensure control of: who can post (posting ability) and who can see the page (country/ age restrictions) as well as having control over what is being said on your news feed (page moderation/ profanity filter). Taking account of the number of 'likes' on the page. Tracking the comments on posts, shares of posts, and 'likes' of posts made on the page. Setting up Facebook polls asking users questions about current postings, classes, activities and preferences. Asking instructors from classes and activities to participate in handing out questionnaires and taking attendance in their classes. - Where participants heard about the page and/or class, event, or activity. - Their impressions of the page and classes. - The feelings and emotions of the participant before, during, and after the activity. - Intentions of the class participant to continue utilising the page as a resource or suggesting the page to a 'friend'. Creating leaflets that can be handed out in physiotherapy clinics. Promotion of the Facebook page or social media resource may be brought up in discussion with the appropiate patients who are part of the target audience. Within an assessment, a physiotherapist can promote the page once physical inactivity is recognised as an issue. physiotherapists to bring up the topic of physical activity. Please click the following link to see the flow chart. Promoting the Facebook page in local high schools and youth clubs. Word of mouth proves to be more effective than other types of marketing and is most appropiate form of promotion for the resource if no funding is available. Expand on how these CPD activities are relevant to their practice, currently and in the future. How this has added value to their practice and demonstrate. How it benefits the service user. These standards can be met by using reflective practice within eportfolio. It can be argued that the increased promotion of preventative medicine is relevant to all healthcare professionals within all clinical specialities. “ Everyone who is involved in the delivery of healthcare in Scotland is asked to play their part in making this vision a reality and to live the values that are shared across Scotland’s Health Service to guide the way they work and decisions they take”. As a physiotherapist, if an individual does not meet national recommendations as to type and amount of weekly physical activity, not only could that individual be guided as to what they need to do, but also how to achieve this. The social media resource or Facebook page provides the opportunity to make this a reality. This would benefit the service user as well as enhancing quality of practice. Guidance should be given on the basis of their social history routinely, independent of health related risk factors. However, it may be appropriate to incorporate expert advice as to what classes may be more appropriate than others considering the patient’s ailment or condition. This resource has highlighted the current guidelines related to physical activity and teenage females and the theory underpinning these guidelines. Current participation levels and the importance of health promotion have been analysed. The importance of social media and its potential role in targeting the chosen demographic has been established. Equally, an overview of the key areas that should be addressed in order to provide an effective intervention have been summarised. This resource has also outlined the legal, regulatory, and professional considerations that should be considered. Finally, a user- guide to initially establish a Facebook page has been provided as an example of a suitable social media tool, and potential means of evaluation and promotion has been offered. This resource has deliberately taken a broad approach to the use of social media in order to allow the user to adapt it as they see fit, with relevance to their specific aims. Many tools and links have been provided within this Physiopedia guide to allow a physiotherapist to create and maintain an effective social media resource aimed at promotion of physical activity in teenage females. Further progression of the resource can be made from its evaluation and continuous reflection through the use of eportfolio; reflective models can assist the user in this process. This resource may be adapted by any health professional to target a wide range of populations and interventions. ↑ 1.0 1.1 1.2 1.3 Department of Health, Physical Activity, Health Improvement and Protection. Start active, stay active: a report on physical activity from the four home countries' Chief Medical Officers. London: Department of Health, 2011. ↑ 2.0 2.1 Sedentary Behaviour and Obesity Expert Working Group. Sedentary Behaviour and Obesity: Review of the Current Scientific Evidence. London: Department of Health, 2010. ↑ 3.0 3.1 3.2 Department of Health. At least five a week: Evidence on the impact of physical activity and its relationship to health. A report from the Chief Medical Officer. www.webarchive.nationalarchives.gov.uk/+/dh.gov.uk/en/publicationsandstatistics/publications/publicationspolicyandguidance/dh_4080994 (accessed 10 October 2013). ↑ Dumith SC, Gigante DP, Domingues MR, Kohl HW. Physical activity change during adolescence: A systematic review and a pooled analysis. International Journal of Epidemiology 2011;40(3):685-98. ↑ Janssen I, LeBlanc AG. Systematic review of the health benefits of physical activity and fitness in school-aged children and youth. International Journal of Behavioural Nutrition and Physical Activity 2010;7(40):1-16. ↑ Artero EG, Ruiz JR, Ortega FB, Espana-Romero V, Vicente-Rodriguez G, Molnar D, Gottrand F, Gonzalez-Gross M, Breidenassel C, Moreno LA, Gutierrez A, Helena Study Group. Muscular and cardiorespiratory fitness are independently associated with metabolic risk in adolescents: the Helena study. Pediatric Diabetes 2011;12(8):704-712. ↑ Ekelund U, Anderssen SA, Froberg K, Sardinha LB, Andersen LB, Brage S, European Youth Heart Study Group. Independent associations of physical activity and cardiorespiratory fitness with metabolic risk factors in children: the European Youth Heart Study. Diabetologia 2007;50(9):1832–1840. ↑ Ekelund U, Brage S, Froberg K, Harro M, Anderssen SA, Sardinha LB, Riddoch C, Andersen LB. TV viewing and physical activity are independently associated with metabolic risk in children: the European Youth Heart Study. PLoS Medicine 2006;3:488. ↑ Andersen LB, Harro M, Sardinha LB, Froberg K, Ekelund U, Brage S, Anderssen SA. Physical activity and clustered cardiovascular risk in children: a cross-sectional study: the European Youth Heart Study. Lancet 2006;22(368):299–304. ↑ 10.0 10.1 10.2 Kesaniemi A, Riddoch CJ, Reeder B, Blair SN, Sorensen T. Advancing the future of physical activity guidelines in Canada: an independent expert panel interpretation of the evidence. International Journal of Behavioral Nutrition and Physical Activity 2010;7(41):7-41. ↑ 11.0 11.1 11.2 Department of Health and Human Services. Physical Activity Guidelines for Americans.http://www.health.gov/paguidelines/guidelines/default.aspx (accessed 7 October 2013). ↑ Strong WB, Malina RM, Blimkie CJR, Daniels SR, Dishman RK, Gutin B, Hergenroeder AC, Must A, Nixon PA, Pivarnik JM, Rowland T, Trost S, Trudeau F. Evidence based physical activity for school-age youth. The Journal of Pediatrics 2005;146(6):732-737. ↑ 13.0 13.1 Janssen I, LeBlanc AG. Systematic review of the health benefits of physical activity and fitness in school-aged children and youth. International Journal of Behavioral Nutrition and Physical Activity 2010;7(40):7-40. ↑ Shephard RJ ed. Advancing physical activity measurement and guidelines in Canada: a scientific review and evidence-based foundation for the future of Canadian physical activity guidelines. Applied Physiology, Nutrition, and Metabolism 2007;32:S2E. ↑ Tremblay MS, Colley RC, Saunders TJ, Healy GN, Owen N. Physiological and health implications of a sedentary lifestyle. Applied physiology, Nutrition, and Metabolism 2010;35(6):725-740. ↑ National Institute for Health and Clinical Excellence. Promoting physical activity for children and young people. NICE public health guidance 17. London: National Institute for Health and Care Excellence, 2009. ↑ World Health Organiztion. Global Recommendations on Physical Activity for Health. Geneva: WHO Press, 2010. ↑ 18.0 18.1 18.2 Scottish Allied Health Professions Directors Group. Our Pledge to Increase Physical Activity in Scotland. Edinburgh: NHS Scotland, 2012. ↑ Evans M. 23 and 1/2 hours: What is the single best thing we can do for our health? www.youtube.com/watch?v=aUaInS6HIGo&feature=player_embedded (accessed 02 October 2013). ↑ Women’s Sports Foundation . Keep Her in The Game. 2012. http://www.youtube.com/watch?v=URVYgTbbryE (accessed 26 October 2013). ↑ 21.0 21.1 21.2 21.3 Sports Scotland. Making women and Girls more Active a Good Practice Guide. 2013. http://www.scottishstudentsport.com/assets/downloads/making-women-and-girls-more-active.pdf (accessed 7 October 2013). ↑ 22.0 22.1 Women’s Sport and Fitness Foundation. Teenage Girls and Dropout. 2008. http://www.wsff.org.uk/system/1/assets/files/000/000/275/275/bde5b8839/original/Teenage_girls_and_dropout.pdf (accessed 8 October 2013). ↑ 23.0 23.1 23.2 23.3 NHS Scotland. A Route Map to the 2020 Vision for Health and Social Care. 2013. http://www.scotland.gov.uk (accessed 7 October 2013). ↑ The Chartered Society of Physiotherapy (CSP). Public Health. 2013. http://www.csp.org.uk/topics/public-health. (accessed 8 October 2013). ↑ Merrian-Webster. Social Media. 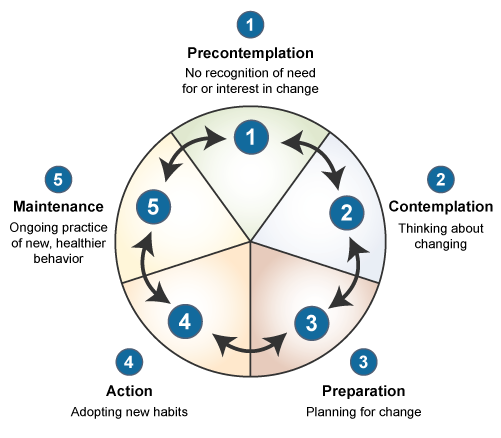 http://www.jmir.org/2011/3/e48/ (accessed 20 October 2013). ↑ Mayfield, A. What is Social Media. California: Creative Commons, 2008. http://www.icrossing.co.uk/fileadmin/uploads/eBooks/What_is_Social_Media_iCrossing_ebook.pdf (accessed 20 October 2013). ↑ 27.0 27.1 27.2 Pring, S. 100 more social media statistics for 2012. http://www.agentmedia.co.uk/social-media/100-more-social-media-statistics-for-2012/ (accessed 20 October 2013). ↑ Paul Allen Media. 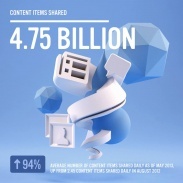 Social media UK statistics http://www.youtube.com/watch?v=IO1Qi5swY-Q (accessed 20 October 2013). ↑ 29.0 29.1 NHS Health Scotland. AHP Directors physical activity pledge. http://www.paha.org.uk/Announcement/ahp-directors-physical-activity-pledge (accessed 20 October 2013). ↑ Pingdom. 2012. Report: social network demographics in 2012. http://royal.pingdom.com/2012/08/21/report-social-network-demographics-in-2012/ (accessed 20 October 2013). ↑ 31.0 31.1 BBC. Many under 13’s ‘using Facebook. http://www.bbc.co.uk/news/technology-13129150 (accessed 20 October 2013). 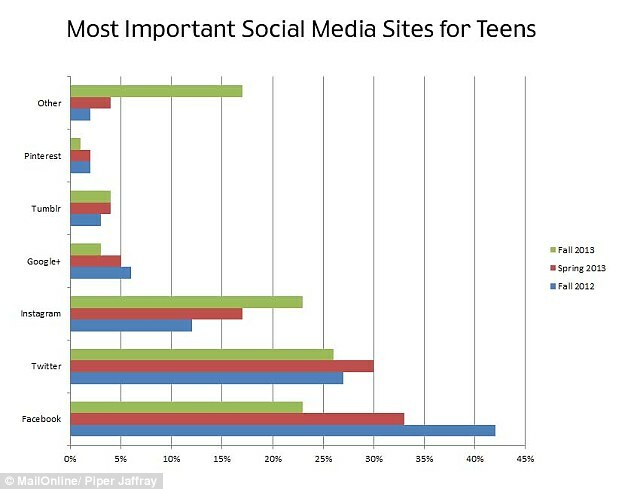 ↑ Greig, A. Twitter overtakes Facebook as the most popular social network for teens, according to study. Mail Online. October 24 2013. http://www.dailymail.co.uk/news/article-2475591/Twitter-overtakes-Facebook-popular-social-network-teens-according-study.html (accessed 25 October 2013). ↑ 33.0 33.1 Borzekowski, D. and Rickert, V. Adolescent cybersurfing for health information: A new resource that crosses barriers. Archive of Paediatric Adolescent Medicine 2001;155: 813-817. ↑ Ettel, G., Nathanson, I., Ettel, D., Wilson, C. and Meola, P. How do adolescents access health information? And do they ask their physicians? The Permanente Journal 2012;16(1): 35-38. ↑ Lau, P., Lau, E., Wong, D. P. and Ransdell, L. A systematic review of information and communication technology – based interventions for promoting physical activity behavior change in children and adolescents. Journal of Medical Internet Research 2011;13(3):e48. ↑ Marcus BH, Owen O, Forsyth LAH, Cavill NA Fridinger F. Physical activity interventions using mass media, print media and information technology. American Journal of Preventative Medicine 1998; 15(4):362-378. ↑ 37.0 37.1 37.2 37.3 Weinburgh RS, Gould D. Foundations of sport and exercise psychology. 4th ed. Champaign, IL: Human Kinetics, 2007. ↑ 38.0 38.1 38.2 Lox CL, Martin Ginis KA, Petruzzello SJ. The psychology of exercise: integrating theory and practice. 3rd ed. Scottsdale, Arizona: Holcomb Hathaway Publishers, 2010. ↑ Culos-Reed SM, Gyurcsik C, Brawlet LR. Using theories of motivated behaviour to understand physical activity. In: R. Singer, 2 ed. Handbook of sports psychology. New York: Wiley, 2001. ↑ Prochaska JO, Diclemente CC, Norcross JC. In search of how people change. American Psychologist 1992;47:1102-1114. ↑ Bandura A. Social foundations of thought and actions: a social cognitive theory. New Jersey: Prentic Hill, 1986. ↑ 42.0 42.1 Bandura A. Self-efficacy: the exercise of control. New York: Freeman, 1997. ↑ Sherwood NE, Jeffery RW. The behavioural determinants of exercise: implications for physical activity interventions. Annual Review of Nutrition 2000;20:21-44. ↑ Kahn EB, Ramsey LT, Brownson RC, Heath GW, Howze EH, Powell KE, Stone EJ, Rajab MW, Corso P, The Task Force on Community Preventive Services. The effectiveness of interventions to increase physical activity. A systematic review. American Journal of Preventive Medicine 2002;22:73-107. ↑ Robbins LB, Kazanis AS. Barriers to physical activity perceived by adolescent girls. Journal of Midwifery and Women’s Health 2003;48(3):206-212. ↑ 46.0 46.1 Neumark-Sztainer D, Story M, Hannan PJ, Tharp T, Rex J. Factors associated with changes in physical activity: a cohort study of inactive adolescent girls. Arch Paediatric and Adolescent Medicine 2003;157:803-810. ↑ Allison KR, Dwyer JJM, Makin S. Perceived barriers to physical activity among high school students. Preventive Medicine 1999; 28: 608-615. ↑ Sallis JF, Prochaska J J, Taylor C. A review of correlates of physical activity of children and adolescents. Medicine and Science in Sports and Exercise 1999;32(5):963-975. ↑ 49.0 49.1 Kohl HW, Hobbs K. Development of physical activity behaviour among children and adolescents. Paediatrics 1998;101:549-554. ↑ 50.0 50.1 Dishman RK, Motl RW, Saunders R, Felton G, Ward DS, Dowda M, Pate RR. Self-efficacy partially mediates the effect of a school-based physical-activity intervention among adolescent girls. Preventive Medicine 2004;28:628-636. ↑ Dishman RK, Motl RW, Sallis JF, Dunn AL, Birnbaum AS, Welk GJ, Bedimo-Rung AL, Voorhees CC Jobe JB. Self-management strategies mediate self-efficacy and physical activity. American Journal of Preventive Medicine 2005;29(1):10-18. ↑ Vescio J, Wilde K, Crosswhite JJ. Profiling sport role models to enhance initiatives for adolescent girls in physical education and sport. 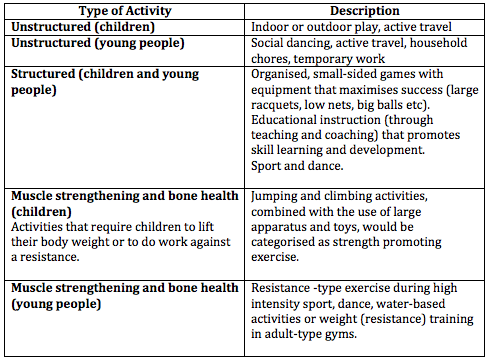 European Physical Education Review 2005;11(2):153-170. ↑ Shroff H, Thompson JK. The tripartite influence model of body image and eating disturbance: a replication with adolescent girls. Body Image 2006;3:17-23. ↑ Elgin J, Pritchard M. Gender differences in disordered eating and its correlates. Eating and Weight Disorders 2006;11:96-101. ↑ Levine MP, Murnen SK. “Everybody knows that mass media are/are not a cause of eating disorders”: a critical review of evidence for a casual link between media, negative body image, and disordered eating in females. Journal of Social and Clinical Psychology 2009;28:9-42. ↑ Bucchianeri M, Arikian A, Hannan P, Eisenberg M, Neumark-Sztainer D. Body dissatisfaction from adolescence to young adulthood: Findings from a 10-year longitudinal study. Body Image 2013;10(1):1-7. ↑ Jackie. Medias’ effect on teen girls’ body image and self-esteem. http://www.youtube.com/watch?v=F0pwXRQxSYE (assessed 2 November 2013). ↑ Campbell A, Hauseblas HA. Effect of exercise interventions on body image: a meta-analysis. Journal of Health Psychology 2013;14(6):780-793. ↑ 59.0 59.1 Grier S, Bryant C. Social marketing in public health. The Annual Review of Public Health 2005;26:319-339. ↑ 60.0 60.1 The Chartered Society of Physiotherapy (CSP). Social Media Guidance. 2012. http://www.csp.org.uk (accessed 22 October 2013). ↑ National Society for The Prevention of Cruelty to Children (NSPCC). Safe Network. 2013. http://www.safenetwork.org.uk (accessed 22 October 2013). ↑ The Chartered Society of Physiotherapy (CSP). Information to guide good practice for physiotherapists working with children. 2007. http://www.csp.org.uk (accessed 22 October 2013). ↑ Mesko, B. Social Media in Clinical Practice. London: Springer, 2003. http://link.springer.com/book/10.1007/978-1-4471-4306-2/page/1 (accessed 11 October 2013). 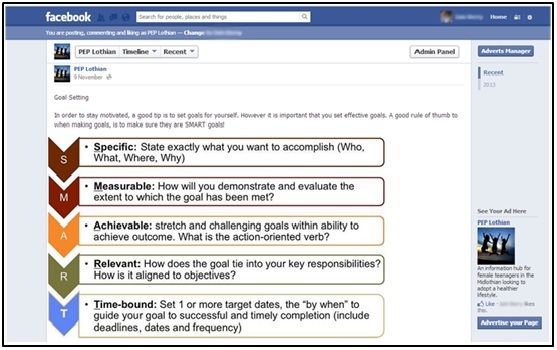 ↑ Pineda, N. Facebook Tips: What’s the Difference between a Facebook Page and Group? 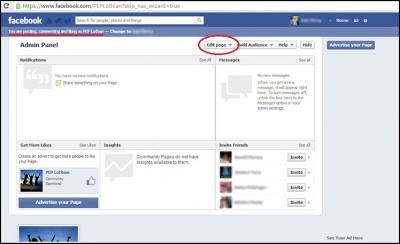 2010. https://www.facebook.com/notes/facebook/facebook-tips-whats-the-difference-between-a-facebook-page-and-group/324706977130 (accessed 18 October 2013). ↑ 67.0 67.1 Health And Care Professions Council (HCPC). Putting your CPD profile together. 2013 http://www.hpc-uk.org (accessed 10 November 2013).